It’s the Saturday before school starts for many of us. If you are anything like me, you have had the syllabus that’s going to transform your students’ lives complete for a full 2 months and are kicking back and relaxing on this fine holiday weekend. 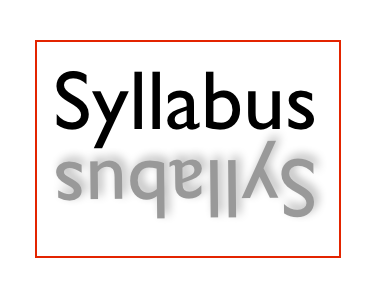 Many people who are deciding to use flipped classroom techniques, like Peer Instruction or clickers, may be wondering how to describe them on their syllabus. Here is some language for explaining the rationale for your innovations and some scripts you can modify and customize for your class. Learning physics is not simply the acquisition of correct information. Learning requires integrating new information with your own knowledge and experiences, and delivery of information by itself doesn’t help you develop your own understanding of the material. What this means is that I cannot simply ‘transmit’ knowledge to you — you will have to take an active role in the learning process. [Here, he describes the rationale for his flipped-like process.] I have written down all the information for the course in the course notes of which are available online. For me to present all that information again in class would be a poor use of your time. If you prepare for class by reading the course notes and letting me know what part you found most difficult, then we can use class time to work together to develop a deeper understanding of the material. One unsatisfying alternative to building a solid understanding is rote memorization and recall, which invariably leads to boredom and frustration and which has little, if any, lasting value. I don’t want you to worry about having to “remember” lots of information in this course — you are free to consult your notes or book during all work for the course, including all examinations. [Describing the rationale for teaching with Peer Instruction]. Collaborative, written and oral communication skills are fundamental to effective practice in higher education. Do a search for almost any higher education job and you will find near verbatim the following phrases as job requirements: Strong interpersonal skills; ability to work in a team setting; strong written and oral communication skills. The following learning opportunities are designed to help you demonstrate these specific skills after the course is complete. [Describing what will happen in class and the clicker]. In this course, your learning opportunities will primarily be active (you engage directly in learning), versus passive (taking notes and listening). Each class meeting will be organized by a mini-lecture or introduction to a concept followed by a series of questions (“ConcepTests”) and peer discussion (where the teamwork, interpersonal skills come in) pertaining to that content. To respond to the ConcepTests asked in class, you will use a “clicker” or other compatible device. Come early to class to obtain a clicker, and register by following the instructions on the card. By answering at least 30 ConcepTests you will receive 1% extra credit toward your final grade. [Describing what will happen outside of class] WarmUp Exercises. Each class meeting is designed based on the assumption that assigned reading will be completed before class. Warming up by doing the readings allows us to spend time going in depth into the concepts and ideas we are learning versus simply covering the reading material. We will rarely discuss all materials in class, however, each article is carefully selected to help you reach the learning outcomes stated at the beginning of the syllabus. I will not comment on every WarmUp exercise, but I will read every one, I will score each one on effort, and I will use the feedback you provide in class. At 11:59PM the day of each class meeting, a WarmUp Exercise based on your reading will be due online using ClassWeb. If you fail to complete a WarmUp before its associated class meeting, you will receive no points for that WarmUp. This course will be using the eInstruction student response system. You will need to purchase a clicker (ISBN: 9781881483816) from the bookstore and bring it with you to every class session.The cost of the clicker is $23.75. There is also a $10 activation fee per semester (or $21 for lifetime activation). The purchase of a CPS pad is NOT optional; it will be used as an integral part of this course. I will provide a short demonstration of how to use CPS in class. Thank you for this information; it’s just what I’m looking for! I do have one question: how much of the final grade is given over to Warm Ups? I was thinking maybe 5 or 10%? Or are students more inclined to do the readings if a higher percentage is at stake? Thanks for this entry. I included a section in my course syllabus about bringing your own device but not the rationale behind it.